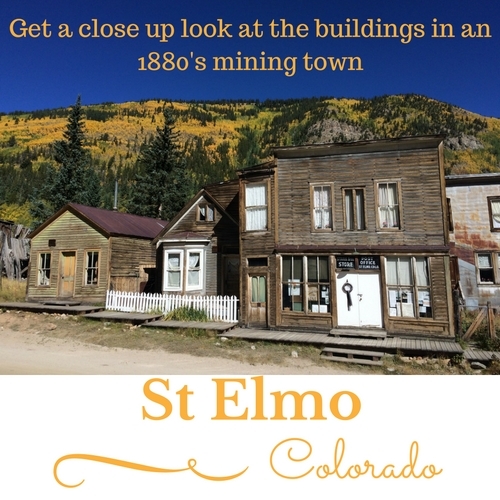 Known as Colorado's "Most Original Ghost Town", St Elmo sits along Chalk Creek at 10,000 ft. Much of the original architecture has been frozen in time providing a historical record of an early Rocky Mountain mining town. The Cash-Williams building(on the right) has been a funeral home and a brothel. While the number of year-round residents can be counted on one hand, the summer months bring hundreds of visitors to Main Street during the day. Adventurers come from all over the world to take photos of the old mining town, feed the chipmunks, or ride on hundreds of miles of OHV trails that link to the town. The streets quickly empty after 5 pm, leaving only a few summer residents and wildlife out to enjoy the cool evenings. St. Elmo General Store is open from mid-May to late September. The store has souvenirs, snacks, antiques, and a 1 room rental cabin. You can also purchase chipmunk food for the numerous furry friends that gather daily across the street. September to mid-October is a great time to check out the changing fall colors along Chalk Creek and along the ATV & Jeep trails. During the winter months, Snowmobiling and Snowshoeing are popular. The main road into town is sometimes clear enough for 2wd, but deep snow will prevent you from taking the roads towards Tincup Pass or Hancock, even with 4wd. Nearly all of the town is private property. Please be considerate of the owners when exploring and taking pictures. Take Chaffee County Road 162 approximately 15 miles west of Nathrop Colorado. The last 5 miles is a dirt road and can get sloppy during the spring snow melt. The road is pretty clear most of the winter. Around 1878 miners and suppliers began setting up camp in the upper Chalk Creek Canyon at the confluence of the North and South forks of Chalk Creek. During April and May 1880, prospectors, businessmen, merchants, and hundreds of employees of the South Park Railroad began arriving in what was originally known as Forest City. To avoid confusion with the post office, the name was changed to St. Elmo, and the town was officially incorporated in December 1880. For a brief period from 1880 to 1882, St Elmo was the junction of several important transportation routes. Most traffic between Denver and Aspen or Denver to Gunnison passed through St Elmo. The Chalk Creek & Elk Mountain Toll Road ran west along the north fork of Chalk Creek, across Tincup Pass, thru the town of Tincup and on to Aspen. The Alpine & South Park Toll Road followed the west bank of Chalk Creek's South Fork to Hancock. From there it crossed Williams Pass and passed thru Pitkin before arriving in Gunnison. A month after St Elmo was officially formed, the Denver and South Park Railroad reached town in January 1881 . By July the railroad reached the town of Hancock. A short year later, in July of 1882 the Alpine Tunnel was complete and the first train traveled to Gunnison. A devastating fire in April I89O destroyed most of the business district on East Main Street. The stone fire wall near the center of town prevented the blaze from consuming the west end of Main Street. 1908 - Stark Brothers begin purchasing properties. 1909 - A new era at the Mary Murphy Mine revives the local economy for several years. 1910 - Final closing of the Alpine Tunnel. The cost of maintaining the tunnel was too expensive to keep it open. 1919 to 1922 - Mary Murphy Mine gradually shuts down operations. 1926 - The Colorado and Southern Railroad abandons its Chalk Creek branch and soon after the Stark family is all that remains. Roy Stark had already recognized the potential of the area for tourism and recreation and the Stark family began to acquire more abandoned houses and turn them into rental cabins for tourists and fishermen. Roy Stark promoted the town's attractions through press releases. The family's general store, combining store, post office, telegraph desk, boardinghouse, and cabin rental agency into a single operation, became the focus of St. Elmo's identity. Through the Stark family's efforts, most of the buildings in St. Elmo survived, avoiding the fate of the other mining communities in the Chalk Creek district. 1933 - Roy Stark passes away. His mother Anna dies a short time later. Tony & Annabelle remain as the protectors of St Elmo. 1952 - Post Office closes on September 30. 2002 - On April 15th a massive fire destroys town hall, jail, and Stark Family residences. Town Hall & Jail have been rebuilt since then.